Hosung Choi and his unorthodox swing are heading to the PGA Tour in February, and one NFL star wants in on the action. 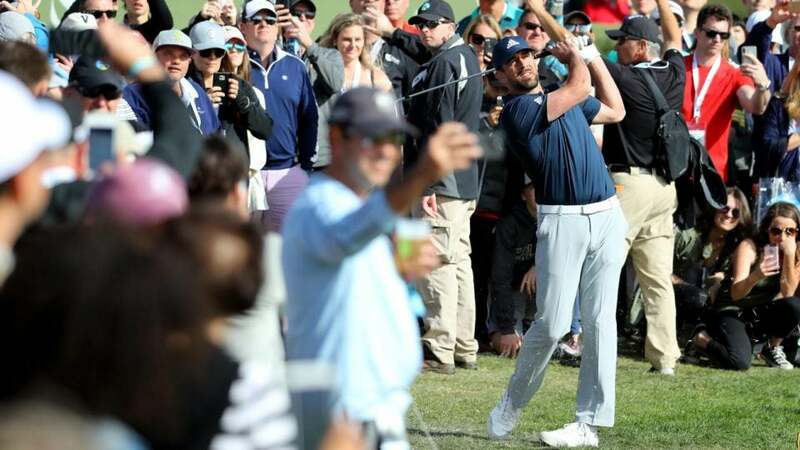 Green Bay Packers quarterback Aaron Rodgers took to Twitter to express his desire to tee it up with the Korean golf sensation at the AT&T Pebble Beach Pro-Am. On Monday, Choi accepted a sponsor's exemption to make his PGA Tour debut at Pebble Beach in just a few weeks. To celebrate the news, the official Twitter account of the Pebble Pro-Am sent out a graphic Monday evening featuring various facts and stats from Choi's career. https://twitter.com/attproam/status/1084978521896861697 The Packers star quarterback saw the photo and quickly retweeted it, writing, "Definitely pair him with me and @jerrykelly13pga #bodyleandreamteam." https://twitter.com/AaronRodgers12/status/1085189423342309376 Rodgers is one of many pro athletes and celebrities who participate in the pro-am event that runs concurrently with the official tournament. Each pro is paired up with an amateur, and the two-person teams compete in four-ball format for a separate trophy. Rodgers teamed up with PGA Tour veteran Jerry Kelly at last year's event. Despite combining for a respectable score of -16 through three rounds, the duo missed the cut. Which amateur ended up on top at last year's event? None other than Rodgers's fellow NFL star and Arizona Cardinals legend Larry Fitzgerald and his Tour counterpart Kevin Streelman. The pair put together an incredible score of -41 over four rounds to take home the title. The next best team finished well back at -34. Rodgers's Packers compiled a disappointing record of 6-9-1 in the 2018 regular season, missing the playoffs. But at least Rodgers now has the time to participate in the event. Although the playoffs don't always stop NFL pros from teeing it up at Pebble. New England Patriots quarterback Tom Brady and head coach Bill Belichick play the pro-am most years, even after devastating Super Bowl losses.